Traditional grains such as millet and sorghum have been steadily losing market share and calorie consumption to substitute grains — wheat, maize, and rice — across the East African region. Because wheat and rice are not native to the region, an increase in their consumption has been accompanied by a rise in food imports. Some of the primary reasons for the low demand for traditional grains include low levels of consumer awareness regarding their nutritional value, lack of dissemination of recipes and methods of cooking that appeal to urban dwellers, and a lack of product development to meet new market demands. Additionally, traditional grains are largely grown and consumed by poor farmers, resulting in their image as a "poor man’s food." They tend to be sold through traditional markets rather than through modern supermarket chains, which further cements their down-market image. Our objectives are to: (1) rebrand millet and sorghum by promoting their nutritional value, health benefits, and general desirability through a cook-off competition of innovative recipes and products, and (2) test how this strategy impacts consumer perceptions and consumption patterns. Current evidence suggests that image is important in shaping diets, which informs our approach. For example, the surge in popularity of wheat and rice can be attributed to the fact that these products were considered “aspirational” foods by middle-class East African consumers, which led to their adoption by the rest of society over time. Therefore, by focusing on higher-income consumers in the short term, we are also essentially targeting the lower-income consumers in the long term. Our project also aims to provide assistance to farmers. As traditional grains regain their popularity, we anticipate that higher demand will lead to higher production, thus potentially increasing income to the farmers who cultivate these grains. To build on the perceived health benefits of traditional grains, and to rebrand their image in a way that is appealing to high- and middle-income consumers, this project will hold a cookery competition in conjunction with a leading celebrity chef and a local television station. This competition will demonstrate many ways that millet can be cooked to meet current market tastes and demands. The goal of the cookery competition is to increase consumer awareness of the nutritional value of millet and sorghum, to increase awareness of the varied ways in which millet and sorghum can be prepared and eaten, and to improve consumer perceptions of the grains by rebranding them as palatable to high- and middle-income consumers. A secondary aim of the competition will be to encourage food manufacturers and supermarket chains to use the recipes generated by the competition to develop innovative new products. Our hope is to build the resilience of traditional grains growing communities by providing new premium markets and also improving the image of the grains. 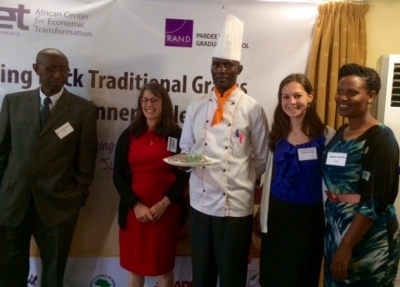 This will serve to increase the general demand for traditional grains. 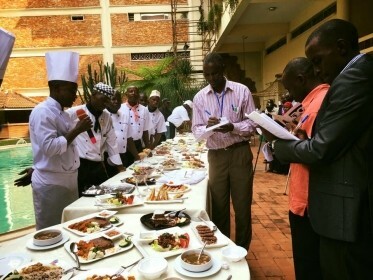 At the Superfoods Cookery Contest in Kampala, Uganda, we awarded over 5,000,000 UGX in prizes to professional chefs, aspiring innovators, and foodies who developed recipes using millet and sorghum.